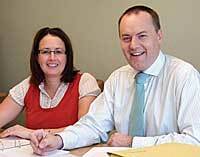 ...was formed by husband and wife partnership Ashley & Claire Hewitt. ...is fully authorised and qualified to provide truly Independent Financial Advice. He was a co-founder and Director of an IFA practice based in South Yorkshire for around ten years and has also previously worked within several large national companies in an advisory capacity. This has provided him with over twenty years experience in the financial services industry. Ashley has also gained the Chartered Institute of Insurers CF8 Long Term Care Specialist examination to help provide solutions around Care Fees planning. ...provides significant administrative support, having previously worked for a High Street Bank for over 15 years in various customer facing and other roles. This means that Claire is not only polite and professional but also used to dealing with the pressure placed upon a busy IFA office. We aim to provide a workable solution to the twin problems of long term care funding and the preservation of the remaining estate. In other words: to ensure that you can afford the care you need for as long as you need it, and that you still have something left to leave to your children and grandchildren! We'll start with a free initial meeting, often at your home or place of work, where we can discuss your circumstances and explore the opportunities available to you. Usually we'll start with a very broad discussion of your concerns and aspirations, before moving on to a thorough financial review and and specific requirements or concerns that you have. We can provide our services by personal visit, telephone, email or post, and usually a combination of any or all of those. Although based in Derbyshire we have clients through out the UK. Our business is dedicated to providing quality Independent Financial Advice, across a broad spectrum of individual interests from across the entire marketplace. These range from protection arrangements, through to individually tailored investments, retirement, wealth preservation solutions, and of course, solutions for financing long term care in later life.